We live in a world where we actively encourage each other to maintain inner peace. When our loved ones endure pain we hold their hands and we tell them to have faith that everything will be alright. We pray for humanity, we mourn people that we’ve never met, and we are shocked on a regular basis through hearing of the most terrible things happening across the world. We are encouraged to have no attachments, so that when we lose things that we love we do not enter a negative state, and we must roll with life as it deals our hand. We must live in the Now, we must not parade our mistakes through our minds when we close our eyes – we must focus on being happy and grateful for what we have. And I agree, these are wonderful spiritual concepts that I try my best to follow. However, as a human being observing our species, I see an abundance of such terrible behaviour happening across the world, and it seems that almost on a daily basis we must process another tragedy that’s happened. This is hard for all of us. There are wars happening when we all want peace; famine and poverty still exist while edible food is being thrown out in abundance by food stores, and we live under a colour coded terror threat which could change at any time. Sometimes living in the moment can be hard, but when we achieve inner peace we can be the eye of the storm – we can observe the movie that is our own life. Maybe you too, often try to take a step back and contemplate what are the underlying causes of all the wars and atrocities we hear of. And contemplation, I’m sure, is necessary in our world where words are manipulated as frequently as they are by politicians and corporate CEOs to make situations more palatable to the general public. 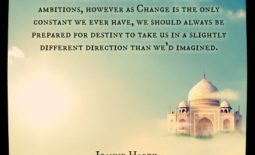 When there is so much to change it can seem overwhelming and we might not know immediately what we could do to make a difference. The problems can seem so huge we might feel powerless. We can live in the now, focusing on the present, waiting for synchronicity to give us a sign, making friends with ourselves, and working on inner peace; but, my question here today is: while you’re living in the now, staying hopefully calm and peaceful, do you still allow yourself to dream? However, time creeps by, responsibilities arrive, and when adulthood is upon us, we might consider how much freedom do we really have? The world ‘is our oyster’ and in theory we can go anywhere, however, as we are not birds, ‘anywhere’ will no doubt involve buying train tickets, plane tickets, or a car – and if we were to imagine staying ‘anywhere’ for longer than a holiday we’d need a job when we got there and money for a house. An adult’s dreams today can be so easily quashed by money, so I wonder, as we’re so busy living in the now, do we still dream as much as we should? As much as we did when we were young and we believed things could be better than they were? What Is The Dream Of Your True Self? If you’re living your dream, then you’re obviously on the right track and any hurdles you encounter will just be life doing its thing, but if you’re not living the dream, if you feel stuck, unappreciated, or bored then I’d like to ask you to reconsider what your dream really is, in the now. What would you really like to do if you could? Do your previous dreams still stand or do they need to be altered to accommodate new knowledge? Where would you most like to live if you could? What job would you do? If you have kids, where would they go to school? Are you truly happy where you are? A restless mind may occupy itself by dreaming of new cars or lavish holidays, but these are not the dreams I’m talking of here; these are dreams of the ego. What I’m referring to is the dreams of your true self. They are the dreams in which you envisage yourself living your most spiritually fulfilled life, dreams which see you doing work that inspires you, where you will be of service to others whilst doing things you naturally enjoy. They are the dreams of peace for all kind and of how we can leave the planet in a better state than we found it. We use the term ‘growing up’ to describe reaching adulthood, but what after that? Whilst our bodies stop growing, our soul continues to evolve through life experiences and how we react to them. If we imagine our minds like a tree we can see how our thoughts are like branches stemming out into the world from the trunk of our core being. As ideas spiral and develop they can grow and flower healthily in a state of peace; but if negative thoughts consume our inner dialogue, they may start behaving like ivy turning and twisting, suffocating the core. 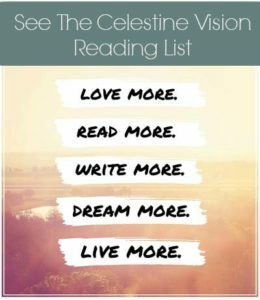 In the Celestine Prophecy book series, we learn how holding a vision will help to manifest the best possible outcome, so we must ensure that we don’t focus so much on the now that we stop dreaming. We must try to refuse unfulfilling situations, ensuring we never let others hold us back from achieving our true potential. Freedom may be a state of mind but if you feel there are shackles around you at the moment, take the time out to consider everything that is binding you, then work through each one individually assessing what you want to do about it. 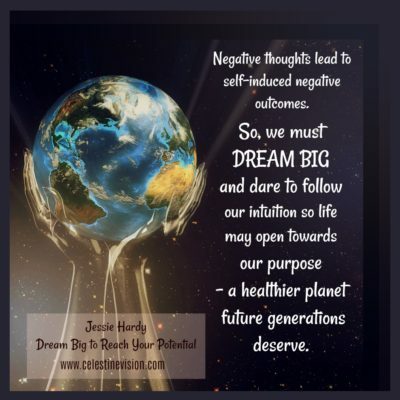 Negative thoughts can lead to self-induced negative outcomes, so dream big, and dare to follow your intuition towards the life you really want and the healthier planet which future generations deserve. To ensure you never miss a new Celestine Vision article, subscribe to our mailing list. You can follow the author Joanne Hardy on Facebook.